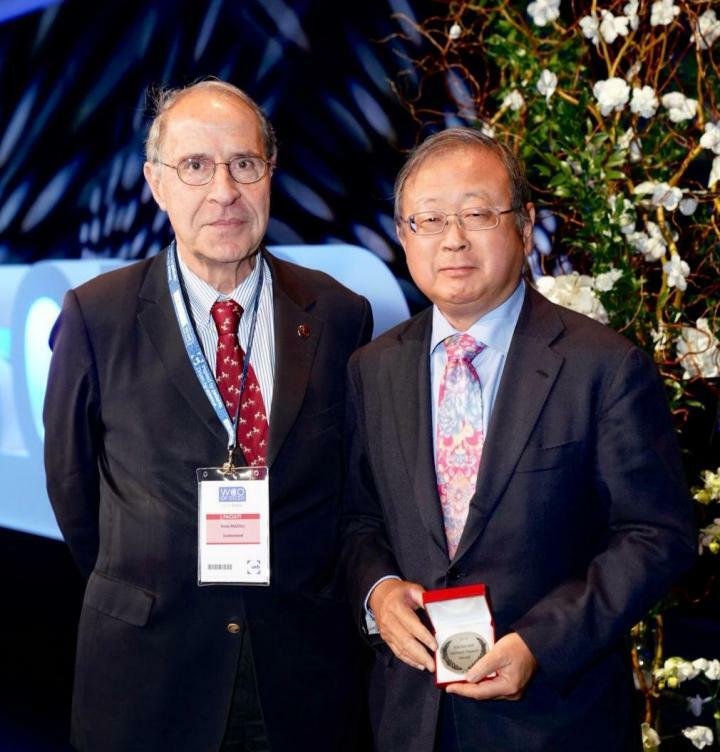 Professor Jonathan D. Adachi has been awarded the prestigious Herbert A. Fleisch ESCEO-IOF Medal at the World Congress on Osteoporosis, Osteoarthritis and Musculoskeletal Diseases. The Medal is named after the late Professor Herbert A. Fleisch, a renowned investigator whose groundbreaking work contributed to the development of the field of scientific knowledge about metabolic bone diseases and their treatment. It is awarded annually by the European Society for Clinical and Economic Aspects of Osteoporosis, Osteoarthritis & Musculoskeletal Diseases (ESCEO) and the International Osteoporosis Foundation (IOF) to a researcher who has made outstanding achievements in bone and osteoporosis research. Dr Jonathan Adachi is a Professor of Medicine at the Michael G. DeGroote School of Medicine at McMaster University. He is the Actavis Chair for Better Bone Health in Rheumatology. Dr Adachi has been involved in clinical trials and epidemiologic research, as well as imaging research in osteoporosis, osteoarthritis and rheumatoid arthritis examining a number of different imaging techniques including, peripheral quantitative computed tomography (pQCT), high resolution quantitative computed tomography (HRpQCT), peripheral magnetic resonance imaging (pMRI) and dual energy x-ray absorptiometry (DEXA). He has been a co-investigator in the CIHR funded Canadian Multicentre Osteoporosis Study (CaMOS), a 20-year, 10.000 subject epidemiologic study examining risk factors for bone loss and in establishing normal bone mineral density values in men and women and in premenopausal, peri-menopausal and postmenopausal women. He holds a separate CIHR grant examining pQCT, HRpQCT and pMRI images of bone structure and strength and will determine the relationship of bone structure and muscle to fractures in a subset of CaMOS subjects. In addition to these CIHR CaMOS funded grants, he is a co-investigator in a cross Canada study of pQCT in determining normal range for bone and muscle density and its relationship to muscle function using mechanography in 5000 individuals ranging from age 5 to age 75 years. Risk factors for fracture and the development of frailty at various ages will be examined. Dr Adachi has over 500 peer reviewed publications and is a respected leader in bone research in Canada and Internationally. He was awarded the Lindy Fraser Award by Osteoporosis Canada. In 2006, he received the North American Menopause Society award for Innovation in Osteoporosis Research. In 2012, he received the Queen Elizabeth II Diamond Jubilee Medal for his work in osteoporosis and in 2014 he received the International Osteoporosis Foundation’s Olof Johnell Science Award for his contributions to the field of osteoporosis.